This was the big one – the entry into ‘the club,’ the big 6-0! Gulp – there, I’ve said it. Age was never a big deal for me. 20, 30, 40 even 50 – none of those “big O’s” phased me. However, there is something about turning 60, and admitting it, that gave me great pause. I think this great pause is more than the actual turn of a calendar page. It has to do with the first-ever-in-my life limiting physical issue. This is something I am not used to and something I do not like one bit. Rewind to last year. As a 40 year running enthusiast, my body began the inevitable process of knee deterioration. All last winter I skirted disaster as I walked cross-campus during the snowiest winter in many moons, on sidewalks that remained snow-covered because the plows couldn’t keep up. The twinges I’d been having (and ignoring) for a couple of years suddenly made their presence known in a cacophonous chorus of pain in minor key. It kept getting worse and an MRI in late May showed a torn meniscus – an easy fix and then back on the trail again – -the running trail, so said the doc. Three months after surgery to repair it, my knee is worse than before. It resembles a cantaloupe and depending on the day, is excruciatingly painful. What really lays me in lavender is that it rules!! If I go to the gym, just doing low-impact stuff – I pay. If I mow the lawn – I pay. If I take the doggies for a walk around the block – I pay!! I am going bankrupt. A week ago, almost to the day, was ‘it.’ D-day. V-day! The day of the big 6-0. What, you ask, does that have to do with my knee? Just this. My wonderful man-friend and quasi fiancé handed me a gift that was very long and strange looking. 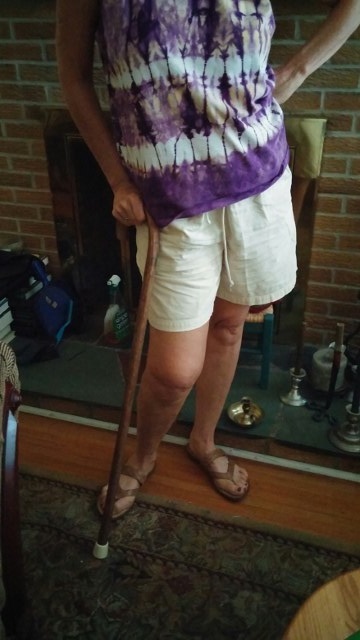 I wrestled with the wrap and lo and behold, out emerged … A CANE!!! And an antique one at that. I am a bit ambivalent about this gift. I love the sentiment and caring that envelopes it. I hate the vision of hobbling around as a stereo-typical senior citizen. I love its construction of sturdy oak. I hate that it is now a necessary accompaniment on some days, especially those when I must hobble about campus. I feel like creating and wearing a placard that says “Former runner” as a way to legitimize my limp and mitigate any associated pity. After all, a sports injury is more respectable than a joint disintegrating due to old age? Old is gold. And a body with aches and pains is a body well-lived. I turn 60 this week. I think you should look at the cane as an aid. You could use it to discipline your nay sayers. Thinking about getting one myself. Beware of old gray mares, we have opinions and are not dead yet! I recall days which showed you were almost gymnastic as a 30 something, remember those Maryanna? True, true, true — but now I am destined to be veritable mermaid! !